Wow! 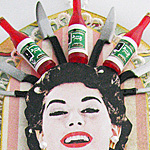 So many uses... beware those snarky housewives! These items are not true dollhouse 1:12 scale. 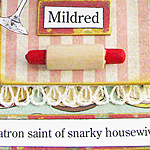 Mildred, Patron Saint of Snarky Housewives by Design Team Member Lora Mahaffey. See the Supply List.